A float tube, also known as a belly boat or kick boat, is a small, lightweight inflatable fishing craft which anglers use to fish from. They were originally doughnut-shaped boats with an underwater seat in the "hole", but modern designs include a V-shape with pontoons on either side and the seat raised above the water allowing the legs of the angler to be the only part of his body to be submerged. Float tubes are used for many aspects of fishing, such as flyfishing for trout or lure fishing for largemouth bass, and enable the angler to fish areas otherwise not fishable from the bank. Float tubes are either "U", "V"-shaped, or circular. A standard float tube consists of an inflated bladder inside a sewn cover providing the seat, reserve air compartments, and tackle storage pockets. Many float tube anglers customize their crafts with rod holders, lights, and electronic fish finders. The angler generally wears stocking foot chest waders and scuba diving flippers, so his legs remain dry. Seated in the float tube, he paddles across the water with a gentle movement of the flippers, then remains still over the chosen fishing ground. An alternative to diving flippers is the "paddle-pusher", or "duck fins." These fins strap onto the angler's feet and have paddles situated on the outsides of the ankles. 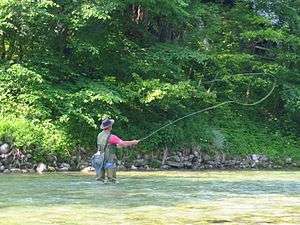 The paddles fold back when the leg moves forward and open when the leg moves back, allowing anglers to move forward in a somewhat less efficient but more natural walking-type motion. The competitive side of float tubing for bass is growing in the US with the Sonoma County Belly Boat Bass Club which was the first of its kind and is by far the largest in the world and in South Africa with The Bass Challenge which offers a tournament trail called the Kickboat Bass Challenge for bass anglers who compete from float tubes. 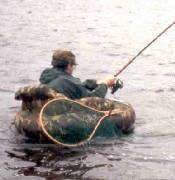 Anglers fishing from a float tube should wear a personal flotation device (a requirement in some states), as float tubes are susceptible to punctures. Additionally, most manufacturers do not recommend using float tubes in moving waters, such as rivers or streams.